The Feb. 1-2 FL-iCAN Climate Conference in Orlando strengthened current relationships and created new ones with Community Activists, Environmental Advocates, Disaster Recovery Champions and Religious Progressives. UUs and members of Indivisible met with their Legislators’ staff members this month in local offices to introduce themselves and the UUJF Legislative Agenda. Members of several Indivisible groups signed up to receive Action Alerts and register for UUJF Legislative Days. The UUJF Climate Resilience Ministry is bringing Community and Climate Activists to Legislative Days on March 12 to meet with legislators and hold a press conference at the Capitol. The Tracker spreadsheet lists over 200 bills that relate to core issues on the Legislative Agenda with references to bill information, committee assignments, committee calendars and talking points. For the first time, targeted Action Alerts are being sent to constituents of committee chairs and committee members urging them to add UUJF supported bills to their committee agendas. Forty-eight participants have registered for Legislative Days including ten members of Indivisible and four community activists from the Climate Assembly. Thirty-four registrants have signed up for the 3-5 pm orientation which was added to our agenda at the request of participants from last year’s program. Description: A history professor in Memphis, Tennessee discovers that the parking lot of the church he attends in downtown Memphis was used as a slave yard belonging to a general in the Confederate Army. The Yard is a story of courage about facing truth. Sponsored by the Truth and Justice Project of Orange County. March 7 & 8: Jan Booher, Executive Director of the UUJF Climate Resilience Ministry, is working with the LEAD Coalition in Panama City on an EPA Environmental Justice Small Project Grant. Jan Booher, Executive Director of UU Justice Florida’s Climate Resilience Ministry, will share experiences and insights from her work on the Frontlines of Climate Change in Florida. Attend events and ask questions. Attend Committee meetings. Bring friends. Register here. Schedule an appointment with a staff person and talk about Legislative Agenda core Issues and specific bills as they affect you and your District. If 34293 - 6829 is not your correct ZIP+4 address code, sign up for Action Alerts so you can communicate with your elected officials when they may be voting. March 13, Wednesday, 8:30 am – 1:00 pm: Meet with your Legislators and staff. Registration closes March 4, 2019. Reverse Global Warming: Introduction to Drawdown based on Paul Hawken’s book - Drawdown. #1 Best-Selling Environmental Book of 2017. Project Drawdown is the most comprehensive plan ever proposed to reverse global warming. 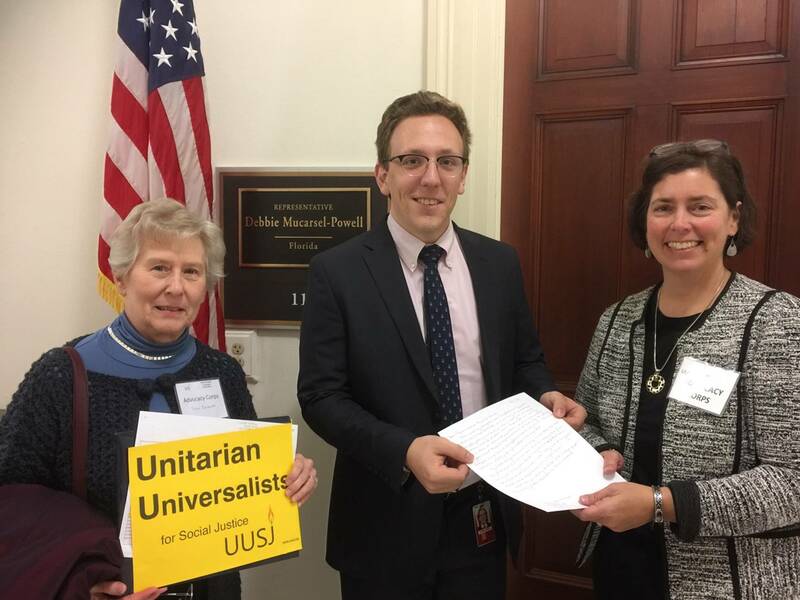 Below is a photo of UUs for Social Justice delivering the hand written letters by UU of Miami for the Congressperson, Debbie Mucasel-Powell. Organize letters from your District and our UU volunteers will deliver the letters and discuss the issue. Join UUSJ’s Write Here! Write Now! (WHWN) February letter-writing campaign - “A New Congress -- New Opportunities for Social Justice Advocacy.” Here’s a flyer for UU Floridians with details. The Board of Trustees of the Unitarian Universalists of Clearwater (UUC) unanimously approved a resolution presented by the Social Justice Council stating that no funds from UUC will be spent in any Publix store. The grocer has refused to come to the table with the Coalition of Immokalee Workers and join the Fair Food Program for ten years now. Publix is headquartered in FL but won’t pay a penny-per-pound premium on tomatoes that gets passed down the supply chain to the workers, who are paid by the growers who employ them. UUC also wrote to the CEO of Publix, informing him of the resolution and the reasons for it. The UUC Social Justice Council encourages other UU congregations in Florida to do the same and refuse to spend their congregation’s money at Publix. Contact socialjustice@uuc.org if you would like a copy of the resolution and letter emailed to you. It is past time for Publix to join the Fair Food Program! About 50 people showed up for the BUILD BRIDGES NOT WALLS RALLY - Make America Welcoming Again in downtown Vero Beach on Feb. 12. Now is the time for America to build bridges! Bridges to our allies, friends, and business partners around the globe…Bridges (and roads) here at home to replace our crumbling infrastructure...and Bridges between all in the human family, regardless of color of skin or nuance of culture. Rally in support of a strong, open, diverse and hospitable America. The Florida Interfaith Climate Actions Network (FL-iCAN) advanced its message and actions at the Climate Impact & Environmental Inequity: Toward Justice for All Assembly on February 1 and 2 in Parramore, an threatened community of Orlando. More than 80 people attended. Representatives of groups working with FL-iCAN discussed their communities’ issues and solutions with each other and Assembly participants. Re-occurring issues were unhealthy water in homes and nature, soil and air contamination, agricultural burning and chemical use, flooding concerns, hurricane vulnerability, gentrification and river headwaters neglect. Jan Booher, Executive Director of the UUJF Climate Resilience Ministry, is taking the message of Hope and Action statewide and beyond. Building Beloved Community-in the Space where Race, Class & Environment Meet is the message that she and community leaders are sharing as they move forward. Click this link for Climate Assembly photos. Send news of your congregations’ past Social Justice events and calendar of future events to info@uujusticefl.org before the March 20 deadline for the April newsletter. The UU Church of Tallahassee graciously hosted this year’s UU Justice Florida Legislative Days event that broke new ground expanding its outreach and effectiveness. The church shared its classrooms for an afternoon Orientation program followed by a briefing on Legislative Issues and opportunities for networking after a wonderfully prepared reception and dinner in the sanctuary. Twenty-seven UUs from 11 UU Florida congregations participated along with eleven members from 5 Florida Indivisible chapters, four members of Protect Our Public Schools (POPS) from Sarasota County and four community leaders affiliated with UUJF’s Climate Ministry. On Tuesday, participants met with their elected representatives and showed support for other groups visiting the Capitol on Tuesday that included Equality Florida, FRRC and ReThink Energy. The focus was on these key issues - Climate change resiliency, environmental protection, support for well funded public schools, criminal justice reform, reproductive justice and gun safety plus implementation of Amendment 1 for Land Conservation and Amendment 4 for Voting Rights Restoration. Efforts will continue until the Florida Legislative session ends May 3. Watch for Action Alerts emailed to constituents of members of committees that are hearing legislation on the UU Justice Florida Tracker. As UUs and impassioned advocates we must make every effort to contact our representatives, make our voices heard and show our strength in numbers. The Tracker follows 253 bills of interest as they progress through 3 committee referrals on their way to a final vote. Of this total, 195 are viewed favorably and the rest are targeted for rejection. There are still 142 bills that have yet to be heard in their first Committee stop which means prospects for passage are uncertain, considering most committees will most likely hear no more than three of these bills at each remaining weekly meeting. Strong constituent advocacy is urgently needed for to show support for changing public policy consistent with our legislative priorities. UUJF Climate Ministry grassroots groups met in Orlando at The Fifth Florida Interfaith Climate Actions Network Assembly and brought messages of inequity and need to Tallahassee as one component of UUJF Legislative Day. Community activists from different areas of Florida spoke at a news conference and with their elected officials about the impact of weather events on their communities. They called for better planning before extreme weather events, more shelters (pre and post event) and addressing safety issues caused by long-term environmental situations such as poor air quality and contaminated ground and water exacerbated by severe weather events. Commonsense suggestions were made for better septic and sewage systems, immediate Health Impact Studies when areas are known to be contaminated with toxins and climate resilient emergency housing. The Community Forum Foundation was represented by Crystal Johnson and Rev. Velma Black-Smith speaking on environmental toxins and preparation and recovery plans. Orlando’s Parramore neighborhood was represented by Lawanna Gelzer speaking on planning and recovery after storms and environmental toxins. Rebuild Bay County was represented by Janice Lucas speaking on the long-term devastation wrought by Hurricane Michael and the long-term needs of the residents. Click these links for photos from the UUJF Legislative Day Evening program and Tuesday’s UUJF Legislative Lobby Day in the Capitol. Use the download arrow on the right side (top right or bottom right) to download photos to your device. Please join Janice T. Booher, MS, Director UUJF Climate Resilience Ministry and others from the faith community this Sunday, March 31st at 7pm EST on a ZOOM meeting (or call in to 720-707-2699) regarding how we can support Pray for Bay—Six Month Anniversary of Hurricane Michael Worship Event. The Meeting ID is 299 951 787. If you have press contacts, if you know people with stories that we can raise up from Bay County, or if you would like to arrange for car-pooling to attend FROM ANYWHERE IN FLORIDA...let's talk. It takes all of us to make a resilient Florida, and worshiping together brings us together. Watch the video of Janice Lucas (Panama City resident) speaking in Tallahassee. Bring your FRIENDS! Pass it on! Reverse Global Warming: Introduction to Drawdown based on Paul Hawken’s book - Drawdown. #1 Best-Selling Environmental Book of 2017. Project Drawdown is the most comprehensive plan ever proposed to reverse global warming. We did not make or devise the plan - the plan exists and is being implemented worldwide! Through videos, group activities, critical discussions, and contemplation, you’ll discover the latest research on how this is possible and emerge filled with hope and ready for action! Suggested donation $15.00. No one will be turned away. Registration encouraged. Walk-ins WELCOME too. UU for Social Justice (UUSJ) Advocacy Corps – Write Here! Write Now! April 2019 update. Looking ahead, the next issue focus is immigration with visits and constituent letter-delivery to the House of Representatives of April 9. Please schedule letter writing in your congregation on March 31 and/or April 7. UUSJ must receive all letters by noon April 8. Additionally, April is Earth Month. UUSJ is partnering with UU Ministry for Earth to invite congregations around the country to collect letters on climate change during the month of April and mail them to UUSJ for delivery to Senate offices on May 14. Because of anticipated volume, UUSJ must receive your letters by mail (no emails this time) no later than Thursday, May 9. Sign up here for reminders about monthly issues. Let’s get some Florida congresspersons and senators offices in a photo. Let’s get letters delivered on Immigration during April 2019, and in May, on Climate Change. Send news of your congregations’ past Social Justice events and calendar of future events to info@uujusticefl.org before the April 20 deadline for the May newsletter. Copyright © · Unitarian Universalist Justice Florida · All rights reserved.